These are lyrics by Puya that we think are kind of nonsensical. Okay, I'm all for respecting people no matter what color, race, or religion but do they have to go and list some colors that don't even exist? When was the last time you saw a yellow person? Unless they're making a reference to the Simpsons or something. 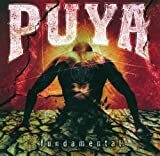 And by the way if you never heard of Puya they're a hard rock band from Puerto Rico I think. They're pretty cool so check them out if you can.